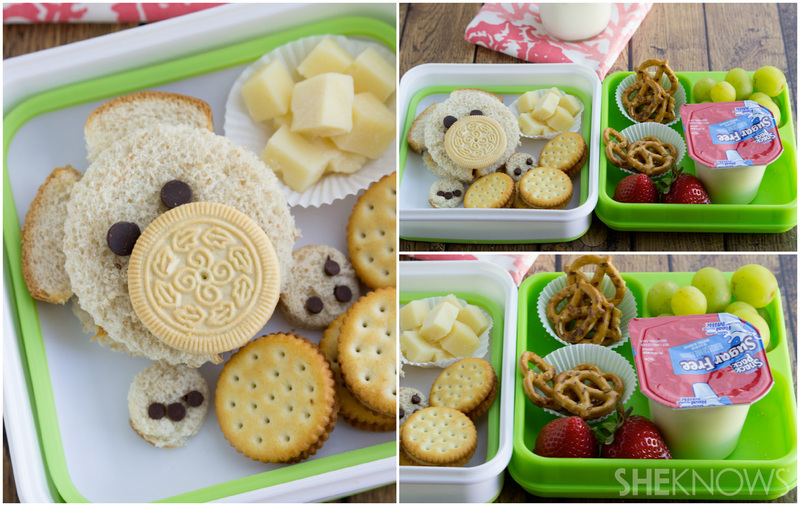 These bento box lunch ideas are perfect for back-to-school time. They’re simple to make, delicious to eat and all around a whole lot of fun. Imagine opening your lunch box and finding this adorable teddy bear. The peanut butter acts as a perfect way to attach the pieces of the bear together, and the cute details (chocolate chips and the golden sandwich cookie) make for small, delicious treats. Spread 2 tablespoons of peanut butter on 1 side of 1 slice of bread and jam on the other slice of bread. Sandwich together the 2 slices. Using a large, circular cookie cutter, cut out the center to form the bear’s head. Using a very small, circular cookie cutter, cut out 2 paws for the feet. Shape the crusts to make ears, and press them into the sandwich, using extra peanut butter to hold them in place. Remove 1 side of the cookie, and either eat or discard it. Using peanut butter, attach the cookie to the bear. Place 2 chocolate chips right above the cookie for eyes. Place the miniature chocolate chip cookies into the paws. 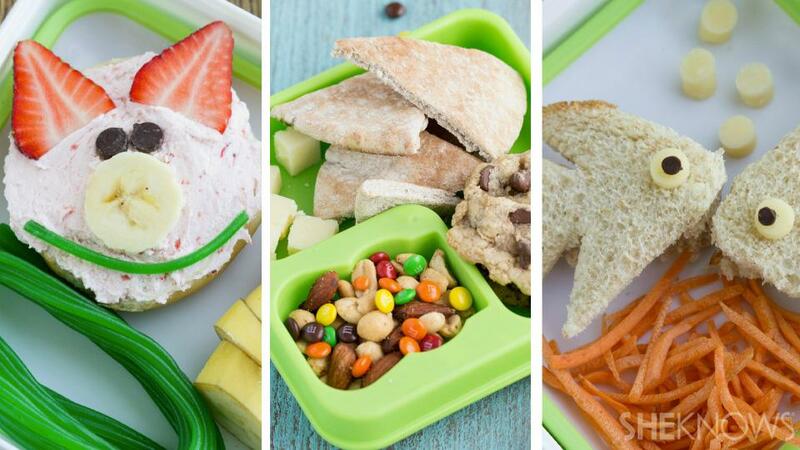 Arrange other snacks your child enjoys for lunch (suggestions are in the ingredient list) into small containers in the lunch box. 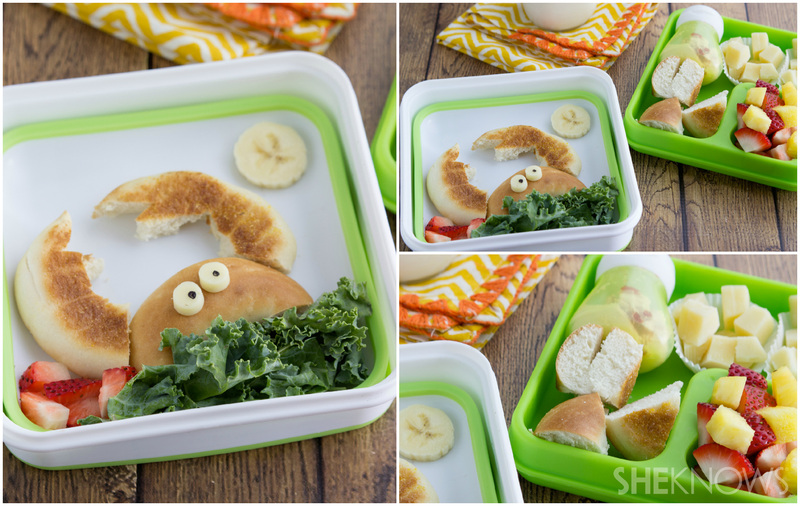 This crabby lunch is a great way to remind your child of the summer fun you had together. Whether you visited the beach or just took your child swimming, they’ll remember fun summer days and know they are loved. Slice the bagel in half. Cut 1 half of the bagel into large pieces, and set them aside. Cut the other half of the bagel in half horizontally. One half will form the crab’s body. Place the kale leaf at the bottom of the box and then the body right above the kale leaf. With the remainder of the bagel, use a knife to cut out pincers for the crab. Using the back side of an icing tip, cut out eyes for the crab. With the edible marker, draw 2 dots for pupils, and attach the eyes to the crab with cream cheese. Attach the pincers with cream cheese as well. Fill up a small resealable container with cream cheese. Place fresh fruit into the box to create sea rocks and a banana slice for the sun. 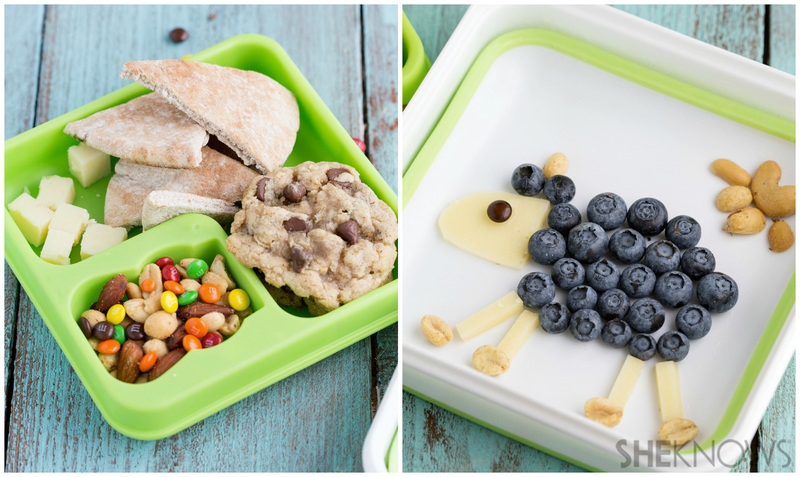 A cute sheep is a great way for your child to eat some more fruit. The snacks on the side help to round out this meal — plenty of protein in the nuts and cheese, plus some carbohydrates from the pita bread. Arrange the blueberries to form the shape of a sheep’s body. Slice the cheese, and then cut it to form the profile of a sheep’s head. Place the brown miniature M&M’s candy onto the head of the sheep. Further slice the cheese to form legs for the sheep. Attach nuts to the bottoms of the cheese legs to create hooves. Form a sun with nuts at the top corner. These adorable fish friends are really just a peanut butter-and-honey sandwich that has been cut out in a cute way. Your child will love to see these fish when opening their lunch box. Spread the peanut butter on 1 slice of the bread. Drizzle the honey over the peanut butter, and sandwich together the 2 slices of bread. Using a sharp knife, slice the bread into the shape of 2 fish bodies. Using the back side of an icing tip, cut out eyes for the fish and bubbles to come from the fish bodies. Place shoestring carrots at the base of the 2 fish, and spoon the ranch dip into a small container. The lion might be tame, but his mane isn’t. It’s made from shoestring carrots and is a fun way to encourage your child to eat vegetables. The rest of this lion is easy to assemble and sure to please your little one. Slice the bagel in half, and spread cream cheese over 1 side. Sandwich the bagel back together, and place it in the lunch box. Spread the carrots around the bagel. Cut the thick slice of mozzarella cheese to form the nose area of the lion. Attach it with cream cheese, and then attach a halved olive with cream cheese to the nose. Using a small, circular cookie cutter, cut out the Asiago cheese for the eye sockets, and attach them with cream cheese. Attach sliced olive pieces with cream cheese to the cheese eye sockets. For the salad, chop up kale, mango and a red pepper. Toss together with cooked couscous, black beans and your child’s favorite dressing. 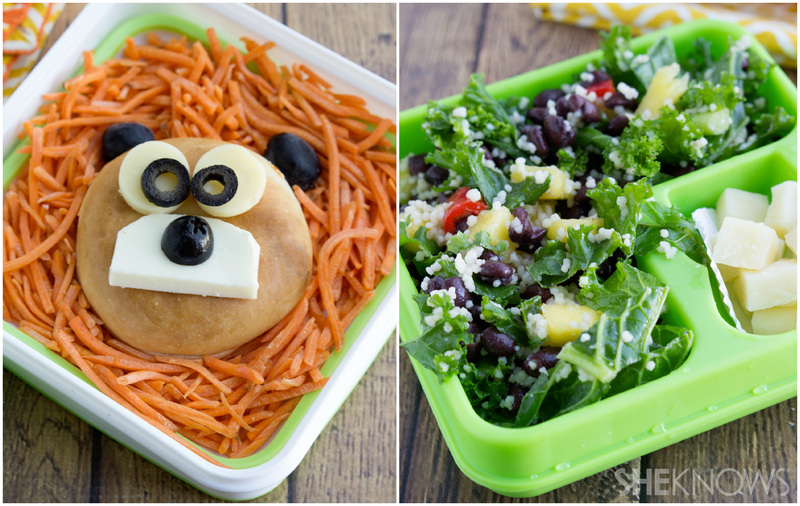 This little piglet lunch is filled with fresh, fruity flavor and is so easy to make. The animal lover in your family will go crazy for this. Place the 2 chocolate chips above the banana slice to form eyes. Place 2 strawberry slices to form ears for the piglet. Add in a piece of the Twizzler for the mouth. Here’s a fun way to showcase the sun and the moon. 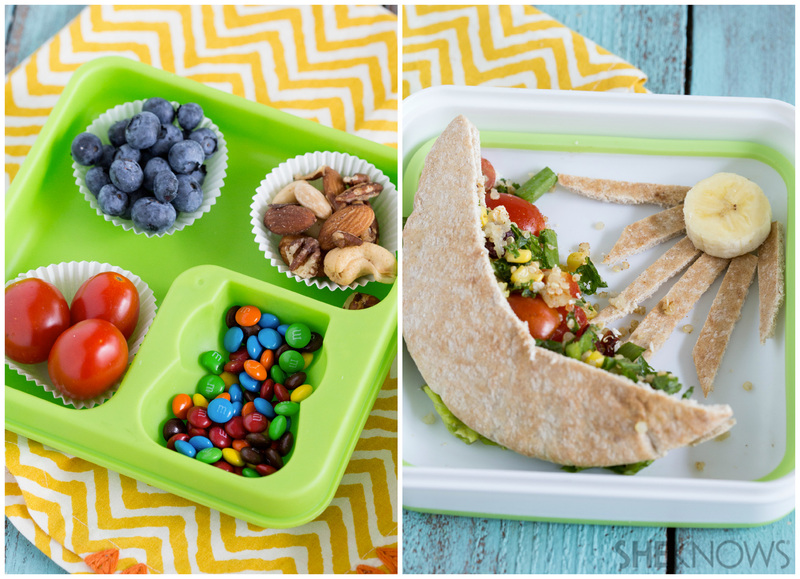 Both are made using pita bread, which is a nutritious and fun substitute for bread. Slice the pita bread in half, and then slice to form a moon. Slice the leftover pita bread to make beams for the sun. Arrange a slice of banana to create the sun, and attach the pita beams to the banana. For the salad, chop the romaine lettuce, and slice the cherry tomatoes in half. Toss together the romaine lettuce, cherry tomatoes, corn, Craisins and cooked quinoa in the Italian dressing. Place the salad inside the pita bread moon.